I recently purchased a used captain's bed for my craft room. 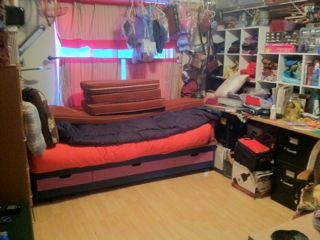 It has drawers underneath, a mattress on top, and then I have a number of pillows lining the wall alongside the twin bed where I curl up with my iPod and a bit of knitting or crochet. Quite a comfortable spot actually, but in my quest to make the bed a lot more comfortable, I decided that I really needed more pillows to line the bed with. Buying upholstery cushions is quite expensive. For the number of pillows I was looking for, I could probably end up spending $150. 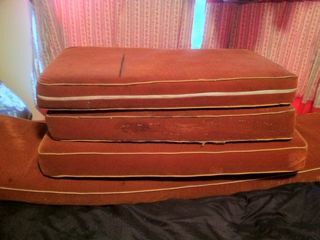 Steve mentioned that he had some older upholstering pillows tucked up in the eaves from an old rv that he has since gotten rid of. I was a little worried about the state of those pillows, but asked them to bring them home. After some airing, I thought that they would do quite nicely, but what I really needed was to get rid of the old covers, and spice them up with something that was more my style. Fabric to cover some old cushions can also be quite expensive, but I have a bit of quilting fabric lying around that I thought could do the job. I was looking for a feminine theme. I didn't have enough fabric to cover all of the pillows in the same pattern, but I thought I could mix and match my cushion covers with something that might look quite pleasing to the eye. The first thing I did was measure the size of the cushion. 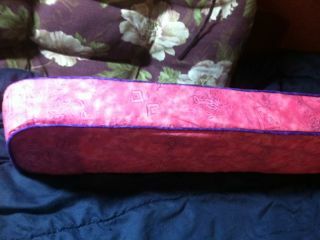 I was a little nervous about attempting a project requiring such a close fit, but I started work on the smallest pillow. I removed the cover, and then separated the fabric pieces. The fabric was old. In some cases, it came apart in my hands. 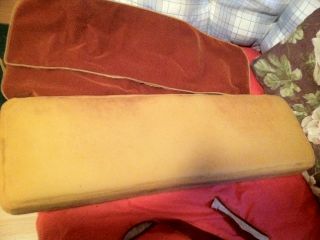 The piping was really old and was not reusable, but I was able to salvage the zipper. I thought about dyeing the zipper to match the color of my fabric but decided not to try this step right now. I had one yard of some pink pattern fabric, and 1/2 a yard of some purple fabric that I could use for bias binding for the piping. 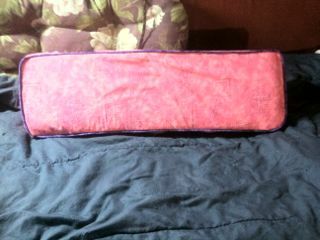 With some careful measurement and placement, I was just able to get enough of the pink fabric to cover the selected pillow face and bands. 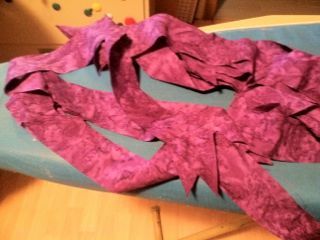 I cut the purple fabric along the bias end up with 10 yards of purpose bias binding. I also got out some piping I got at a garage sale. I was little concerned that the piping was be too fat, it was lot thicker than it's replacement but it was the only piping that I had, and I planned to use it. 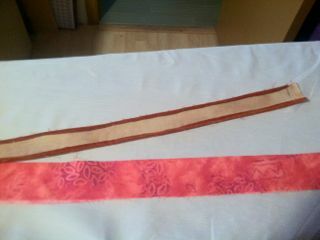 Using a zipper foot, I pre-sewed the 6 yards of piping that this project called for. Many of the articles that I had read suggested you could sewing the piping and fabric together at the same time, but for my first time, I wanted to be sure that the piping was sewn snugly inside the fabric. Inserting the zipper into the band. Applying the band and the piping around the corners. Here's are snapshots of the end result. I'm satisfied with this project, but I've picked up some tips to make the job easier next time.